Salmon skewers ready for the oven. I am loving my new clay oven that was sent to me by Spices of India to use in my recipes. This time I decided to try skewering chunks of marinated salmon and cooking them just as I would in my outdoor tandoor oven. Of course I didn’t get the same charred exterior as I would in a charcoal tandoor but the fish was still amazing. It was so succulent. You could barbecue the salmon or even bake it if you don’t have a clay pot but believe me… it’s worth a purchase. I didn’t need to use any oil to cook the fish and didn’t miss it either. I placed garlic at the end of the skewers to help keep the fish on the skewer as it cooked. I did indulge a bit though with a healthy portion of Cheddar cheese which I added to the marinade. It resulted in a quite unique flavour that I hope you will enjoy. This recipe could be made with any meaty fish such as monkfish, cod or hake. Sample plate. I served this with a coriander and chilli raita. 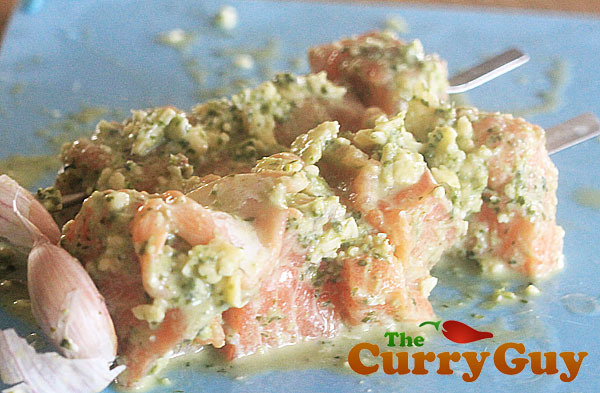 Place all of the marinade ingredients into a blender and blend to a smooth paste. 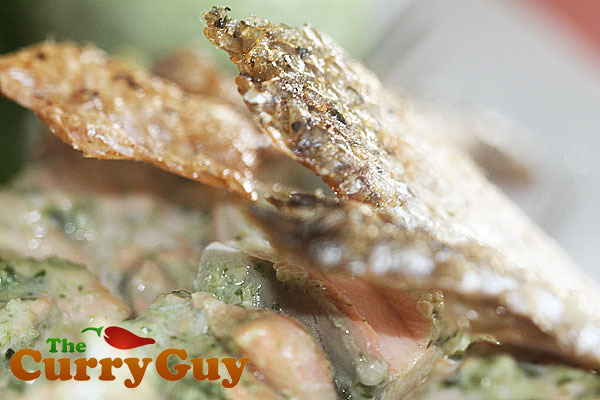 Pour over the salmon chunks and allow to marinate for about 30 minutes. Meanwhile heat your oven to its highest temperature. Soak the clay oven in water for fifteen minutes and then place it in the oven to heat. Skewer the salmon pieces and place a clove of garlic (as pictured) at the end to help ensure they don't slip off when cooking. The raw garlic also adds to the flavour. 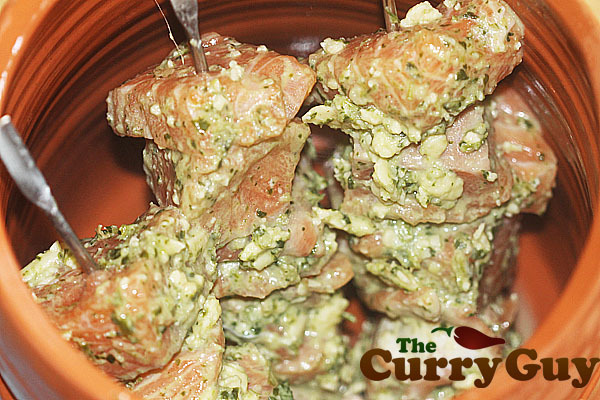 When ready to cook, place the skewered salmon pieces in the clay tandoor, cover with the lid and bake for about 20 minutes until just cooked through. 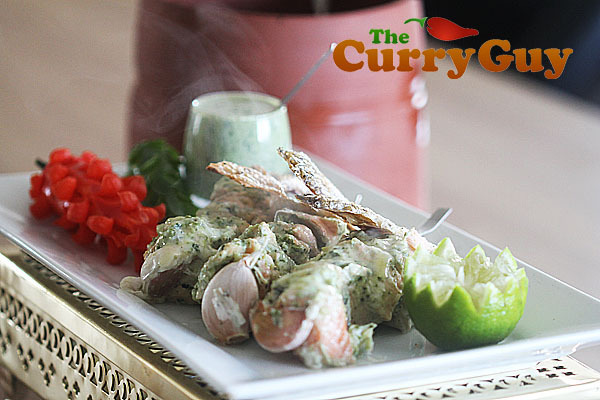 Serve with your raita of choice or simply on its own. I placed the skin from the salmon flat on a baking tray. Then I brushed it with sesame oil and a sprinkle of flaky Maldon salt and baked it in a 200c/400f oven for about 25 minutes until it was crispy. It was then served on top of the fish. I would like to thank Spices of India for supplying me with my clay tandoor to use in my recipes. You can view more details about the product here. The salmon was supplied to me free of charge by Delish Fish. Delish Fish delivers freshly caught seafood to your door throughout the UK. 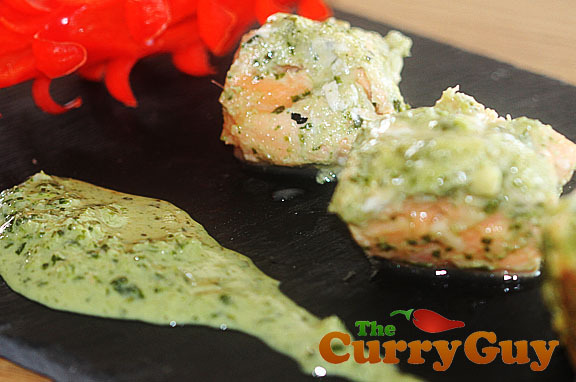 Tandoori Salmon ready to serve.